Nothing can turn guests in your home off more than an unclean environment. If they happen to see your kitchen faucet is very dirty, covered in stains or build up, they may think twice about asking for a glass of water. Having this happen can be embarrassing and to avoid it, you should always keep an eye on the condition of your faucet and clean it when it is getting a bit dirty. This will provide you a clean and safe kitchen environment while also shielding you from the judgment of others. 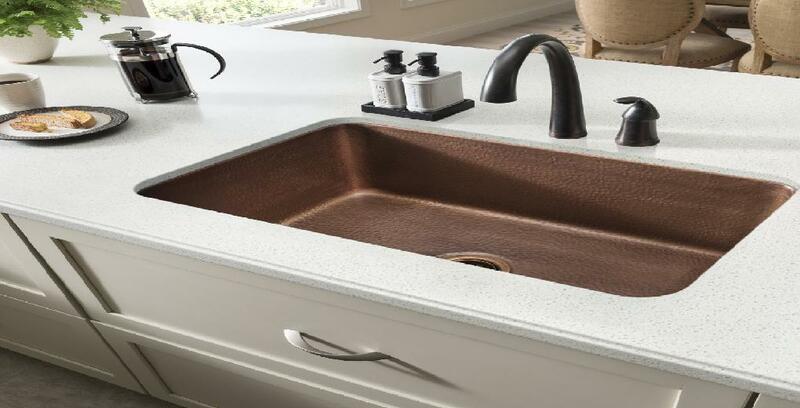 When cleaning a faucet it is important not to use abrasive materials as they can scratch the finish on it. You will need a few tools to help you clean before you get started so you can keep them close by. With these tools, you should get your kitchen faucet clean and look new again. Before you start cleaning access what kind of grime is building up on your faucet. Is it stains? Is it calcium? Is it rust? Look to see what is wrong with the kitchen faucet and then choose the appropriate method of cleaning. To remove stains from your kitchen faucet, use a combination of baking soda and water to make a paste that is thick enough to hold its own shape. Then coat the faucet in the mixture and leave it to sit for two or three hours. Afterwards, set white vinegar aside in a bowl and then soak a sponge in it. Take the sponge to the sink and begin to scrub. The chemical reaction between the baking soda and vinegar will help penetrate the layer of stain and help remove it from the kitchen faucet. You may need to repeat this a few times. For particularly tough stains, dribbled the vinegar on and use a toothbrush to scrub. Calcium deposits build around the very base of your faucet. They are relatively harmless but look rather gross. Sort of like a white flakey substance resting around where your water sprays from. To get rid of it, fill a plastic sandwich bag with vinegar and then tie it around your face to keep it firmly in place. It is important that the calcium soaks in this vinegar overnight as it needs time to work its magic. The next morning, remove the bag of vinegar and then scrub with a toothbrush. This should remove the calcium deposits. Should there still be some stubborn areas, scrub dish soap over them with the toothbrush. Rust is one of those pesky substances that seems to crop up no matter what we do to try and prevent it. However, this doesn’t mean the stains cannot be cleaned. Cut a lemon in half and mix lemon juice, baking soda, and salt until it becomes a paste thick enough to hold its shape. Coat the faucet and allow it to rest for a few hours. Use the rind of the lemon to scrub the faucet after. The rind has essential oils that are good for cleaning. If you still have stains, consider adding a bit of vinegar to the mix. Repeat this as necessary. It may take a few times. In extreme situations, use coca-cola in replace of vinegar. Wear gloves to protect your hands while you work. As you have many things to do day to day, consider leaving these solutions overnight to make the best use of your time. Consider using a chemical cleaner for particularly stubborn stains. Do NOT use abrasive tools as this might damage your faucet. It is very easy to clean your faucet. It is all about figuring out the right combination of ingredients that are easy to find and most likely already in your home. With regular upkeep, your kitchen faucet should stay in good condition for years to come.